Chimney Swifts are commonly referred to as flying-cigars. These cigar shaped gray birds are easy to identify as they fly over cities and suburbs catching flying insects. Chimney Swifts are most noticeable at dusk during migration when flocks numbering in the hundreds or thousands circle in tornado-like flocks above roost-chimneys and then suddenly descend, like reverse smoke, into the chimney to spend the night. This species is found along the east coast of North America south to south Florida and north to Nova Scotia; and westward to south Texas and northward to Saskatchewan. It winters in the upper Amazon basin of eastern Peru, northern Chile and northwestern Brazil. 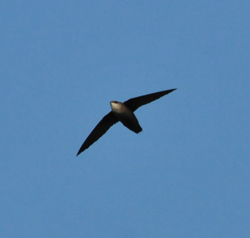 The Chimney Swift is often called "a flying cigar" for its short body and relatively long, sickle-shaped wings. Both sexes are sooty brown above and grayish-brown below, with paler areas on the throat, chin and cheeks. Their long, dark wings are slightly glossy and cross over their tail when roosting. Each tail feather has a long, pointy spine at the end. Rarely seen up close, it spends its life flying in the air or hidden from view clinging to vertical surfaces. Open sky. In urban and suburban areas of eastern North America where there are suitable (masonry) chimneys for roosting and nesting. 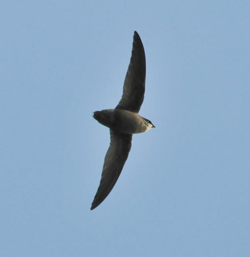 Swifts cannot perch, thus they fly all day long unless they are incubating eggs or hanging on the nest to feed young. Arrive in Tennessee by early April. 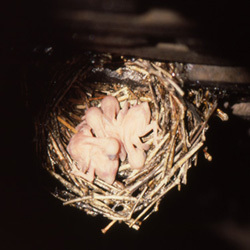 Only one pair will nest in a chimney, but unmated and non-breeding individuals may roost in the same chimney at night. Both parents feed nestlings which leave the nest when about 3 weeks old clinging to the interior wall or "practice" flying around inside for a week before leaving the chimney or tower. Pairs often use the same nest site in subsequent years. Nests and young are vulnerable to snakes, raccoons, cats and some owls and hawks that can enter chimneys and towers. Fumes from unclean chimneys can asphyxiate young and adults quickly. Some that choose older chimney for roosting in the fall are killed by fumes from boilers activated before the birds leave for migration. This species traditionally nested and roosted in large hollow trees in pre-colonial woodlands. As old growth forests were cleared for agriculture, Chimney Swifts adapted to the masonry chimneys of the newly built towns and villages. Populations expanded to the Rocky Mountains and deserts of the west. However, the numbers have been steadily declining since the 1980's as homeowners began to cap their masonry chimneys or install unsuitable metal chimneys. Capping of well-maintained chimneys is usually not needed and only occurs because homeowners have unfounded fears about diseases the swifts might harbor, or are bothered by the mysterious noises of feeding nestlings for a few short weeks in the summer. Closing the damper and packing the area below the damper and fireplace with insulation can substantially reduce the noise. Artificial nesting or roosting chimneys may be created where there are no longer enough suitable chimneys available. Chimney Swift nest with young.